I love living in Nebraska. It’s a beautiful place. But it’s not exactly rich in old west history. What Nebraska has to offer from that era is mostly from people passing through; Oregon Trail and Pony Express sites. 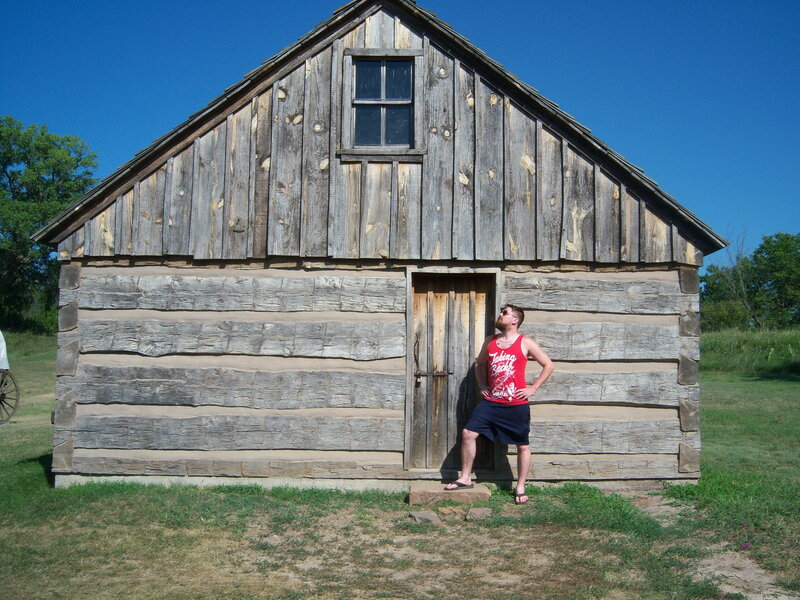 So when I learned about the McClanless Incident, an event which kickstarted Wild Bill Hickock’s legend, and took place at Rock Creek Station, outside of Fairbury, NE, I had to visit. It was July of 2012 and my wife and I had just been to Warped Tour in Kansas City. On our way back I made her come with me to Rock Creek Station. It was pretty out of the way as far as our usual way home goes, but it was worth the effort to get there. When we first arrived at RCSSHP we pulled into a circular parking area in front of a visitors center and museum. The woman at the desk gave us the rundown on the layout of the park and we looked around the museum a while. While I was familiar with the ‘McClanless Incident’, the museum presented some interesting information that I was not aware of. 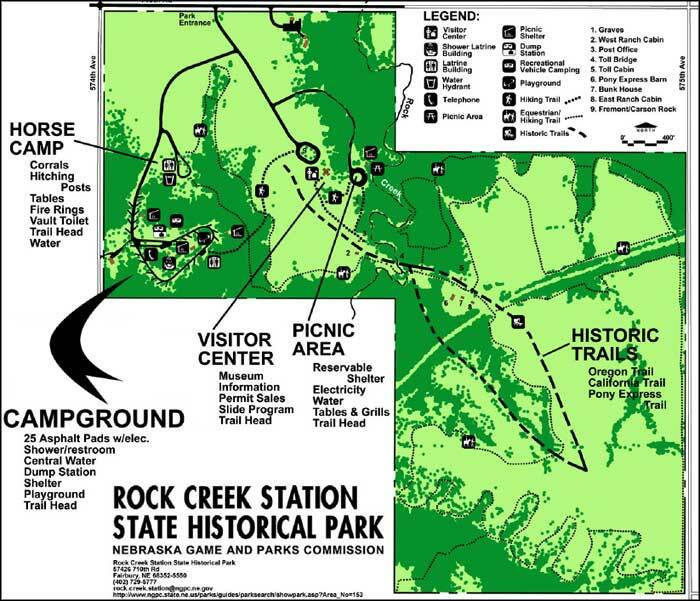 Information about the area’s history as a landmark along the Oregon Trail, where travelers would pay to cross the bridge or possibly pay the consequences of trying to cross Rock Creek on their own to avoid the toll, historical maps and other details about the incident at Rock Creek. You can still see the giant rut created by the thousand of wagons, people and cattle that passed over Rock Creek. The folks who run RCSSHP have even placed a recreation of a wagon in the giant rut to help you imagine what it may have been like for the pioneers traveling cross country. As we left the visitor center we stopped by the wagon before heading down towards the creek. 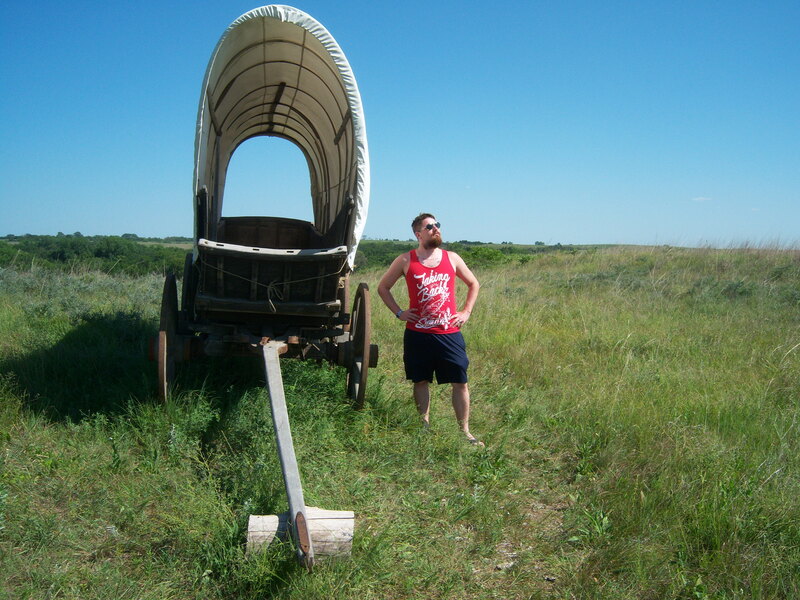 Myself next to the wagon in the giant rut. Down by the creek were several period buildings that recreate how Rock Creek Station would have looked at the time of Hickock being there, which included a barn, toll station, some cabins, more wagons, etc. Unfortunately most of the buildings were locked (it was near closing time or the guides weren’t around or something) so I had to make due with peering through windows. I much more enjoy being able to get inside buildings to really get a feel for the site, but who said life is easy? The park also includes several trails and a campground, but my wife had had enough walking for the day. (Down one hillside is hard on a lady) So we did not check out all that RCSSHP had to offer. But it was a great visit, and quite tickled my history bone. And while much of it was recreated, there was still a lot of evidence of that time period everywhere around the site. It was incredibly interesting, well maintained and I’m glad that it has been preserved and recreated for all of us to enjoy. When: A visit would ideally be from late Spring through early Fall or whenever the weather permits.